Nesting season is upon us, and we are thinking about our backyard and gardens from the birds perspective. Here are few things the birds you are attracting right now will appreciate your doing for them! 1 – With baby birds in the nest and about to fledge, this means there may be chicks on the ground. Many baby birds spend time on the ground right after leaving the nest, and the mother birds only means of keeping them safe from predators is by hiding them. If you love birds in your backyard you already keep your cat inside. If you think your cat needs a little more fresh air, get him a catio so he can enjoy the great outdoors in his own outdoor space, and the birds can safely raise their babies in your yard. You can either make one yourself if you are handy, or buy one that is all set to go! 2 – Fresh, clean water is essential for any bird, and especially so when it gets warmer. Make sure there is an offering of clean water in an elevated shallow pan or bath available throughout the summer months. Nothing is more attractive to birds in summer than clean water for a cooling bath or long drink! 3 – If you need to fertilize your garden, use organic fertilizer. And please, no pesticides on plants or grass. Your birds love eating the insects in your garden, and pesticides both eliminate the bugs and can have a very bad if not lethal effect on the birds themselves. Using any chemicals to fertilize your yard or plants should be avoided to ensure the birds nesting in your yard and their babies remain healthy. 4 – Keep planting those native plants! 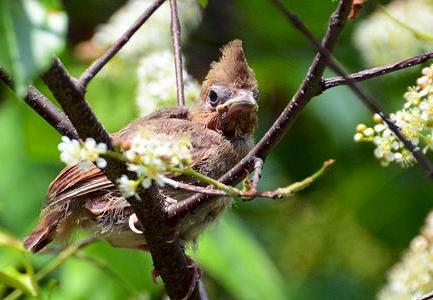 Ornamentals don’t offer the same food sources for birds that plants native to the area do. And these pay benefits all year round – providing insects, natural food and shelter for birds just when they need it. Plus native plants don’t require any fertilization. Another bonus!